This recipe reminds me of Israel. Sighhhhh…. everything with hummus does. Really. That might be because hummus is all I ate there. Anyway, this “20-Minute” simple recipe didn’t seem so simple to me at first. I rarely make shrimp (Dave will. not. eat it) and I’ve never made couscous before. So on the recipe anxiety scale of 1-10 (1 being toasting bread and 10 being a Baked Alaska) this shrimp dish was at a 6… I was worried! Anyway, let me just tell you… it’s freakin’ delicious. So good. It’s like, lick the bowl good. And- yes, I did. Makes 4 Servings of couscous salad and sauce. I made 1 serving of shrimp, 1 of sliced chicken breast for Dave, and the rest of the couscous salad I used for another meal! 1. Make the couscous. 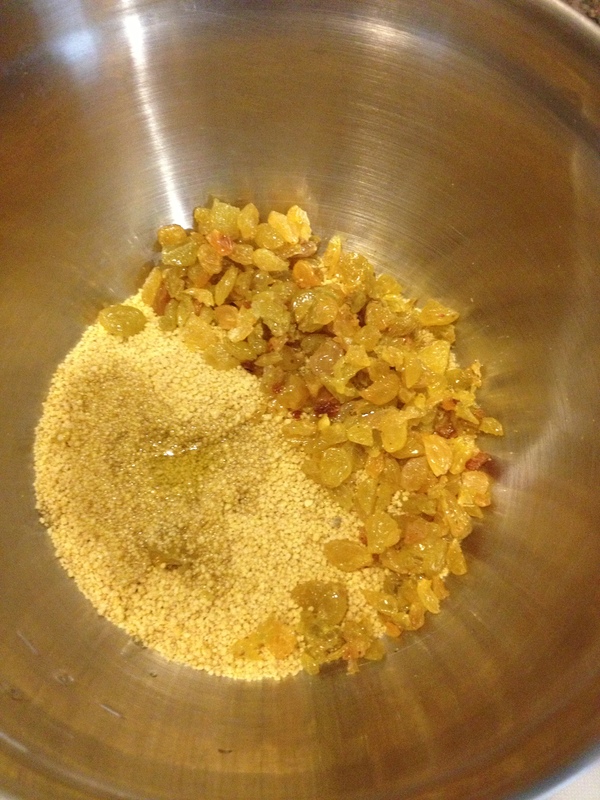 Combine the couscous, raisins and 1 tablespoon of the olive oil in a bowl. Add 1 1/4 cups very hot water, cover with plastic wrap and let sit until all of the water is absorbed and the couscous is tender, about 5 minutes. It’s magic! 2. Make the sauce. Stir together the yogurt, hummus, dill, and 1 to 2 tablespoons water in another bowl. Season with salt and pepper and set aside in the refrigerator. 3. Cook the shrimp. 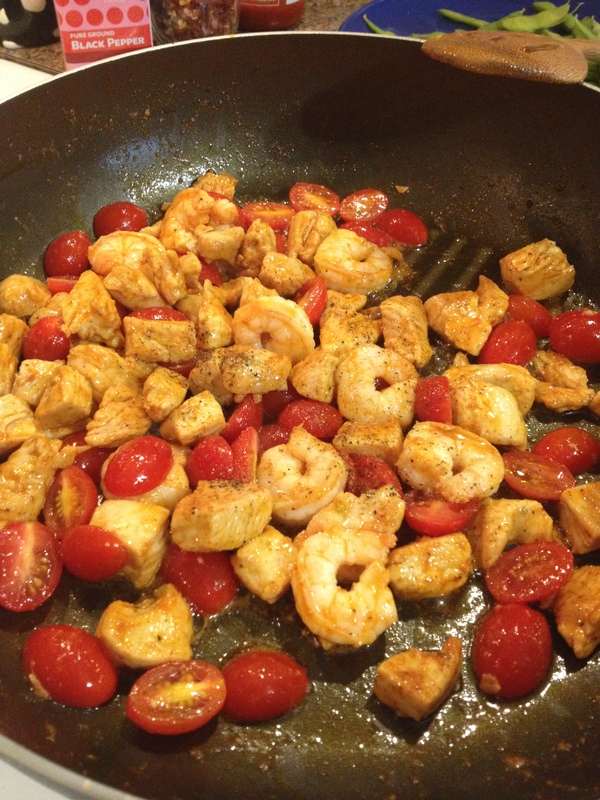 Toss the shrimp, tomatoes, the remaining 1 tablespoon olive oil and hot paprika together. Cook in a small saute pan over medium heat until the shrimp is cooked through (maybe 4 minutes? It does not take long. If you’re using pre-cooked shrimp, just heat through.) Drizzle the lemon juice ontop of the shrimp-tomato mixture. 4. Assemble! 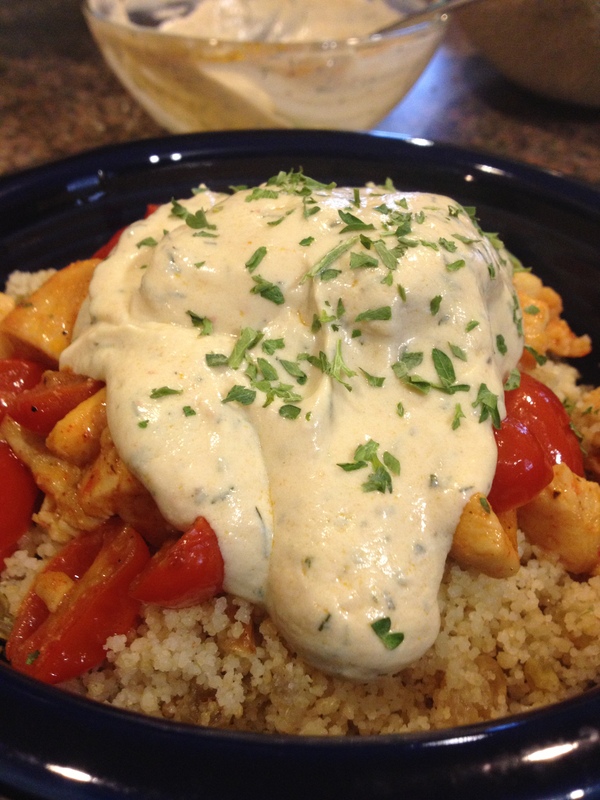 Fluff the couscous with a fork. 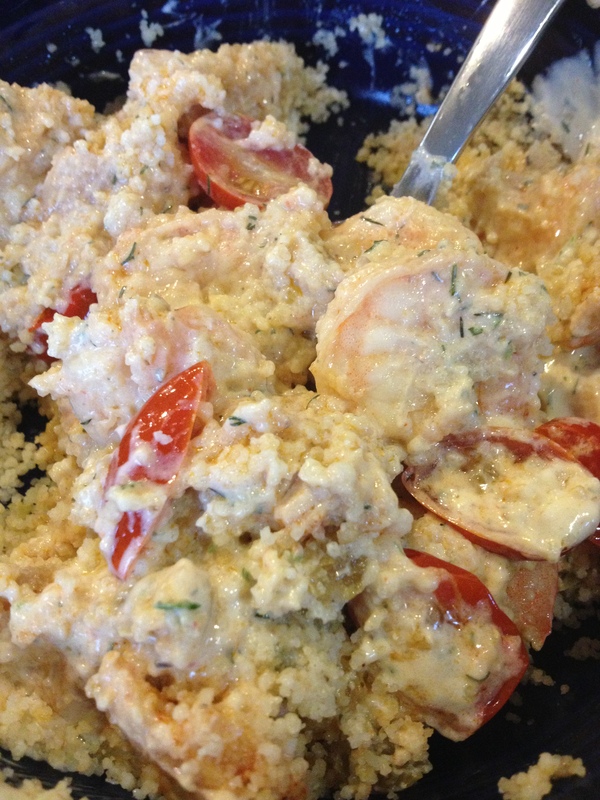 Place the couscous in a bowl or plate, add the shrimp mixture ontop. Scrape any of the saucy drippings from the pan into the sauce and stir. Place a dollop of sauce ontop of the shrimp/tomato mixture. ENJOY! YUM! I topped mine with some parsley. Mixed all up, this is one delicious meal! See, that totally wasn’t hard at all! 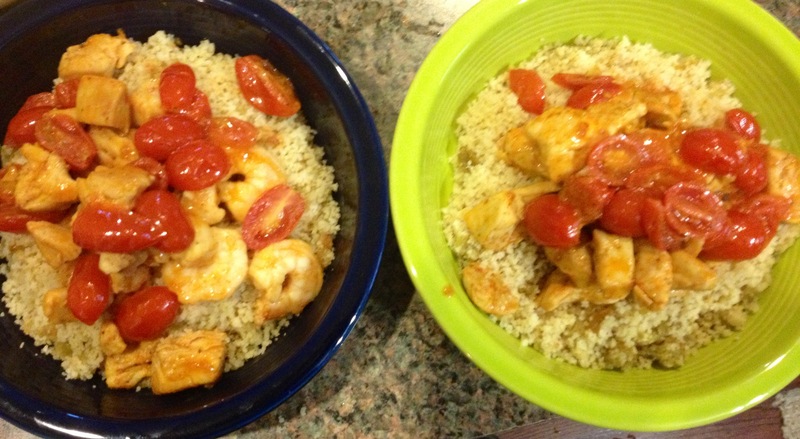 Once you think about it in four simple steps: Make the Couscous, Make the Sauce, Cook the Shrimp, and Assemble! That’s all! It was so tasty and different than anything I’ve ever made before. I really enjoyed a break from all of the spicy food we normally eat.